Accessory Genie - Consumer Electronics and Accessories Industry News: App Happy at Accessory Genie! After reading a Mashable article this morning announcing that there are 100,000 apps now available for the iPad, I couldn't help but wonder how important apps are to people when considering what tablet to purchase. For the most part, my Android friends have the same application as I do on my iPhone, and my coworker's iPad has the same apps as my Samsung Galaxy Tab. Personally, I can't really see 100,000 apps affecting my decision to buy one tablet from another. Like many people, I use basic apps that make my life a little easier and more entertaining. But I wonder if that's just my point of view or if that's the general opinion. I took the liberty of going around Accessory Genie headquarters to find out what the popular apps were, whether for Apple or Android, tablet or smartphone. Of course, not all the apps available for Apple and Android were the same, but there were replacements that were very similar! As you may have guessed, the two most popular ones were Pandora and Facebook. And after those came a slew of basic applications for everyday use, like The Weather Channel App, Bank of America, Chase, Google Maps and other apps that designed to make your life a little easier. Being a social media and tech junkie, I have Mashable and CNET apps on my phone to keep me updated on the latest products and tech related news. Other popular news apps included USA Today, Newsy and the LA Times apps. If you enjoy reading as much as I do and don't have a Kindle or Nook yet, the apps available with Android and Apple tablets are perfect for you. iBooks is a personal favorite of mine, while some of my coworkers prefer apps like Audiobooks, where you are read to. One of my coworkers even has an app called vBookz where books are read to him in robot voices! Of course, there is also that long list of apps that are simply designed to alleviate even the most boring of situations. Popular games apps like Angry Birds and Words With Friends are always fun to have, especially when you have nothing better to do. Want to watch a show or a movie? Check out Flixster or Fandango for movie times at a theatre near you, or check out Hulu Plus or Netflix. Other fun and completely pointless apps that were popular around the office included Google Star Chart, Fat Booth, FML, Zombie Booth, Zippo Lighter, and many, many, many (at least 99,000) more applications. 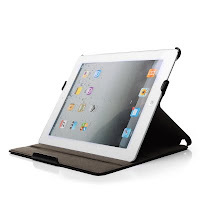 Remember that whether you have an Android or Apple operating system, or if you're looking for apps for your tablet or smartphone, we have all the accessories you'll need at www.AccessoryGenie.com!